Modern medicine has reveled for over a decade in the most stupendous advancement in the history of cancer therapy, a drug discovery that added decades to the lives of patients with chronic myelogenous leukemia (CML) via a gene-targeted enzyme inhibitor. CML is the most common form of leukemia with around 5000 new cases diagnosed annually. Patients who only had a few miserable years to live while they endured the side effects of interferon therapy can now live a normal lifespan and some no longer need to take medication at all, the true definition of a cure. Yet there is a dark side to this success in the war against cancer that is the topic of this report. Pharmacology’s success was short-lived as latent treatment resistance was encountered after 4-5 years of use. This resulted in an expanded search for new molecules to reduce drug-resistant CML with slightly altered versions of the original medication. Despite 3rd generation versions of the drug, the problem of treatment resistance persisted. So pharmacologists began a search for molecules that could be combined with the current medication and sensitize leukemic cells to die off. And that search has resulted in a horrific realization. That playing the current pharmaceutical game of developing patentable overpriced synthetic molecules to treat disease so as to produce billion-dollar blockbuster drugs not only results in the plundering of pooled health insurance funds but has also cost thousands of lives. It is now recognized that a molecule found in nature could possibly have saved more lives with far less side effects at greatly reduced cost than the class of synthetic drugs in wide use today. That lives have been needlessly lost by the insistence that only synthetic drugs are efficacious is a horror that is difficult to contemplate. Photographic evidence of this will be provided in this report. Researchers found a cancer gene called ABL, located on chromosome 9. Part of chromosome 9 fractures and translocates (transports) to chromosome 22 to bind with another gene to form what is known as the mutated Philadelphia chromosome. That other gene has been identified as the BCR gene. This ABL-BCR gene fusion is what fuels the cancer via over-activation of an enzyme called tyrosine kinase that causes white blood cells (lymphocytes) to grow and multiply incessantly. 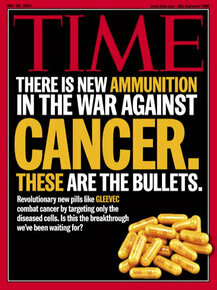 [Cancer Research UK 2012; Nature 1982] Therefore, tyrosine kinase inhibitors serve to treat and even cure this disease. Today patients with chronic myelogenous leukemia are projected to live 30 years from the date of their diagnosis, a far cry from the 3-5 year prognosis with conventional therapy. This major advance in the war against cancer was dampened by unexpected drug resistance to imatinib and spawned many variations of inib” drugs (dasatinib, nilotinib, bosutinib, bafetinib, vemurafenib, erlotinib, gefitinib, crizotinib, ponatinib) with greater efficacy reported. The FDA granted accelerated approval of ponatinib (Iclusig) in 2010 for newly diagnosed patients and had been approved for patients with treatment resistant disease in 2007. [National Cancer Institute 2013] But by October of 2013 a steady increase in the number of serious vascular occlusion (blood clotting) events and heart failure prompted the FDA to issue black box warnings. [Drugs 2014] This dampened the idea of ponatinib as the successor to imatinib. One 400-milligram imatinib pill a day is required for effective treatment. That amounts to $208 per pill/day (costs 46-cents to manufacture). Imatinib generated $4.7 billion in sales annually. [FirstWord Pharma 2012] It is estimated there are ~60,000 patients who take ematinib daily. Over time it became clear that continued development and introduction of newly fashioned “inib” drugs was not going to remedy the problem of drug resistance. Big Pharma needed to go in another direction — how to make leukemia cells more sensitive and less resistant to “inib” drug treatment. The authors of this landmark study write: “the combination of imatinib and resveratrol may be a more effective strategy for human CML therapy. The combination of imatinib and resveratrol represents a paradigm shift in cancer drug development. This may result in a new generation of specific targeted therapies for the numerous malignant conditions for which no efficient drug therapy is currently available.” [Genetics & Molecular Research 2015] Yet their data and blood slides reveal resveratrol is also very effective when used alone. Researchers can’t make their lips say what has now become clear – resveratrol is superior to the entire family of “inib” drugs. There is nothing keeping physicians from combining resveratrol with “inib” drug therapy among terminal patients with progressive leukemia, to be used on a compassionate care basis. FDA approval is not necessary. Resveratrol is a widely available dietary supplement that has not produced notable serious side effects in the past 10 years over a wide range of doses. Why all the foot dragging? Why had resveratrol remained in the research closet so long? Don’t tell us that all along resveratrol has been a more viable alternative to imatinib. Don’t tell us that thousands of CML patients met their premature death while pharmaceutical companies schemed how to profiteer ahead of providing a cure. This is a horror story, a story of greed over cure. The concentration of resveratrol required to inhibit the growth of leukemia cells has been determined and is achievable via oral consumption. One study shows that every 25 milligrams of oral resveratrol equates with a 2-micromole rise in blood levels in humans. To achieve a 25- micromole/milliliter blood concentration about 250-325 milligrams of resveratrol would be required for a 160-lb (70 kilogram) person. This would make a good starting dose for human clinical use. Excessive resveratrol dosing can produce reversible side effects such as Achilles heel tendonitis, headaches, anxiety reactions, racing heart and flu-like symptoms. Loose stool is sometimes experienced when using less pure forms of resveratrol derived from giant knotweed due to its emodin content. So mega-dosing is not recommended. While leukemic patients may be dying needlessly modern pharmacology is predictably attempting to develop a synthetic analog (look-alike) of resveratrol that can be patented to combine with “inib” drugs. [International Journal Oncology 2007; Molecular Pharmacology 2015] Big Pharma must profiteer before it cures. What more do the drug companies know that they aren’t telling us about? For sure, they must know more about why some patients with chronic myelogenous leukemia don’t need to take tyrosine kinase inhibitors any more. However, knowing how to effect a complete cure without the need to take drugs would be counterproductive to the drug industry. It is known that a biological process called methylation, in this instance hypomethylation, causes chromosomal instability and translocations and deletions of genes and loss of genetic imprinting. Methylation is a biological process by which methyl groups are added to DNA. It is important to learn the cancer industry lives in a self-defined world of deceit. Recent criticism of the pharmaceutical industry includes the widely known fact that high-priced anti-cancer drugs often only add a few weeks to months to life. 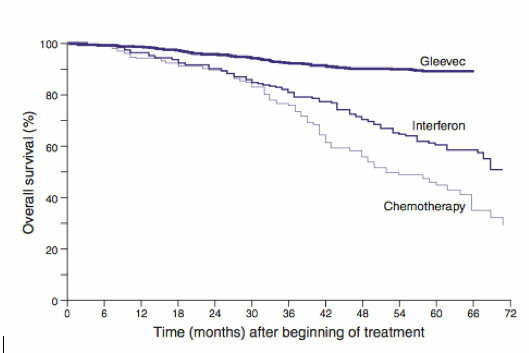 Yet even this reported marginal prolongation of survival often vanishes with assessment of overall survival rather than the narrower measure of cancer survival. Some new cancer therapies shrink tumors and appear to be advances but their mortal side effects often result in the more rapid demise of the patient from other causes, such as chemotherapy-induced heart failure or destruction of the immune system. Furthermore, there is sleight of hand in quoting longer survival times with cancer therapies that are only achieved by earlier detection of cancer. Earlier diagnosis when tumors are smaller only appears to add to survival time but is meaningless as most patients are dying on the same calendar day.